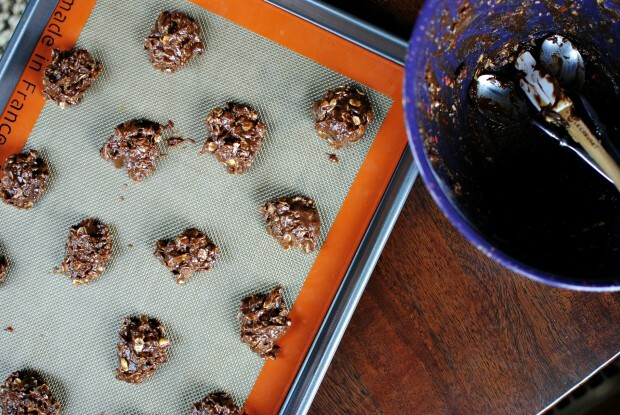 These Flourless Peanut Butter Nutella Oatmeal Cookies are soft and delicious. They are best still warm with the edges crisp and surprisingly buttery! There’s sooooooo much you can do in 20 minutes. Like fold a load of laundry, or paint your nails… orrrr wash a sink-full of dishes. BUT on the reals, who wants to do that when you can make cookies? IN. TWENTY. MINUTES. FLAT. One bowl. One cookie sheet. One… umm I can’t think of a third-one… ummmmmm…. ONE BATCH OF 16 COOKIES! And there is absolutely no flour called for in this recipe. Nada-zip-zilch-ZERO! 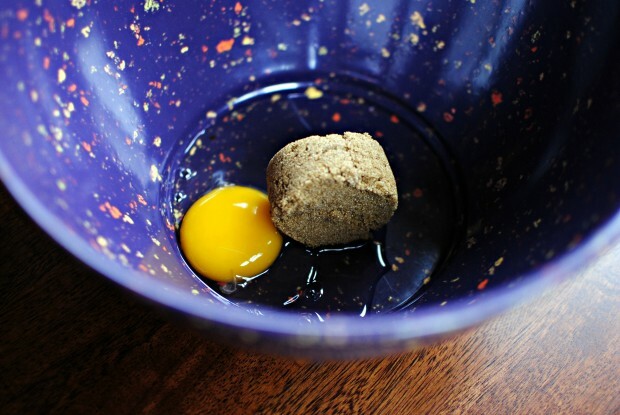 First, start by cracking and adding an egg to a mixing bowl. Next add a quarter cup of brown sugar… dark or light… it shouldn’t matter. 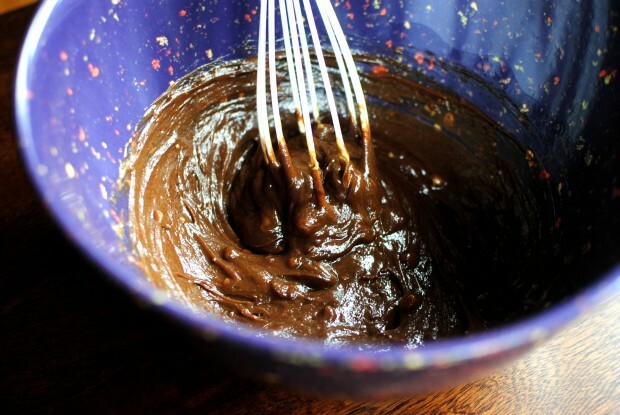 Then add in a tablespoon of whole milk… to keep the batter *gasp* moist. Earlier I measured out a half cup of Nutella with a half cup of PB. I didn’t have an entire 1/2 cup of creamy so I used a little crunchy peanut butter as well. And may I just say the little bites of peanuts were delish. 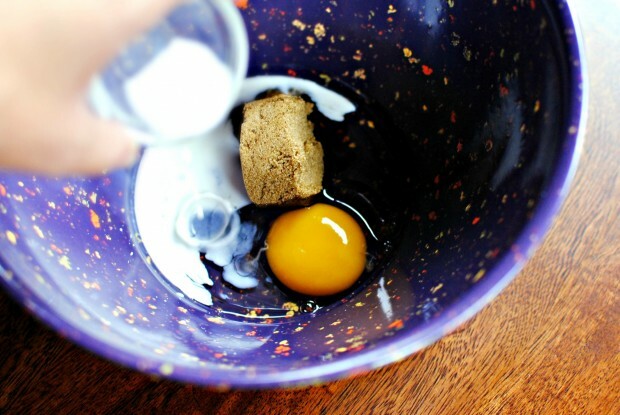 Next, give it all a quick stir to blend everything together. Then add in the salt, baking soda and old fashioned oats. 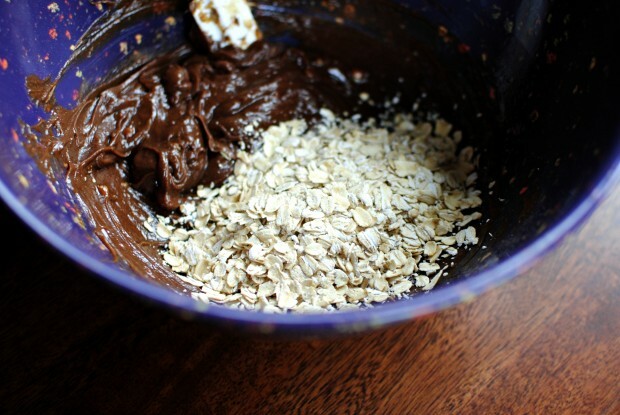 I couldn’t say if quick oats would work here… so if you try it lemme know! Next, give the cookie batter a final stir and go grab two teaspoons. Then drop a heaping teaspoon onto a large cookie sheet, leaving a couple inches in between each one. They spread so you’ll wanna make room! Next, slide the cookie sheet into a 350° oven and bake for 8 whole minutes. Then, once out of the oven, let them rest on the cookie sheet because they will firm up as they cool that should only take 10-15 minutes. Ohemmgeeee! 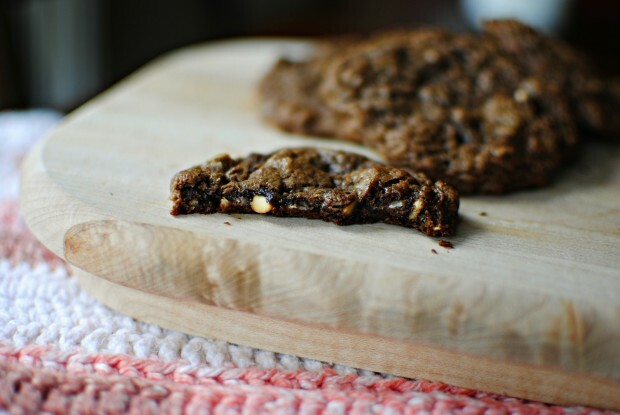 These cookies are best still warm with the edges crisp and surprisingly buttery! The center is chewy, chocolaty and delectable. So don’t be surprised if you eat 3 before you know what hits you. Enjoy! 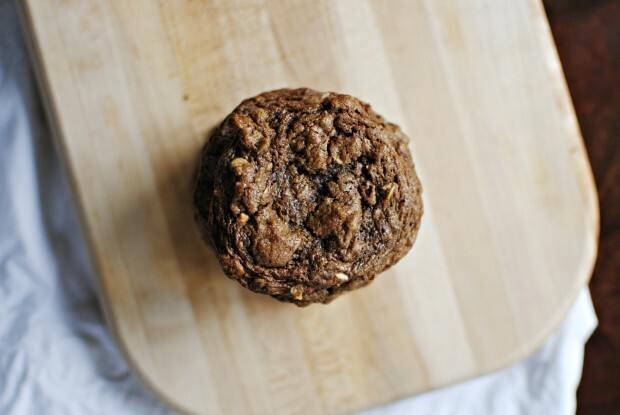 And if you give this Flourless Peanut Butter Nutella Oatmeal Cookies recipe a try, let me know by snapping a photo and tagging me on twitter or instagram! Line a large rimmed baking sheet with a silpat or parchment paper. 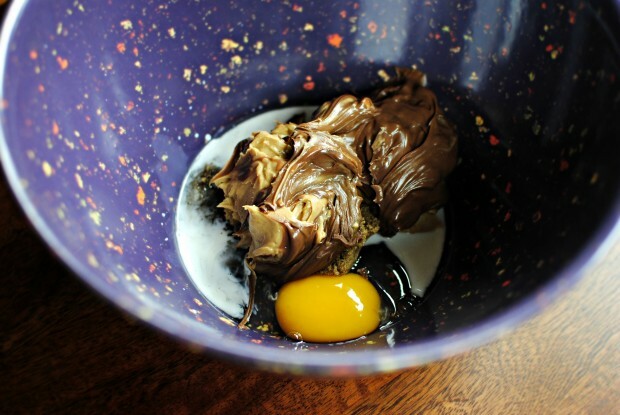 In a mixing bowl; add the egg, brown sugar, milk, pb and Nutella. Mix just until smooth. Add in the salt, soda and oats. Stir. 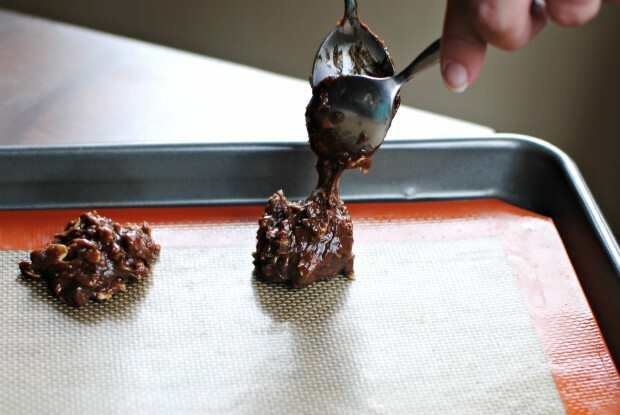 Drop heaping teaspoons onto the prepared pan and pop the cookie sheet into the preheated oven for 8 minutes. Once the cookies are out of the oven, let them cool on the cookie sheet for 10-15 minutes to set up a tad.Serve warm with an ice-cold glass of milk! Seriously love everything about this, especially with the 16-cookie only batch! It helps so much with portion control! 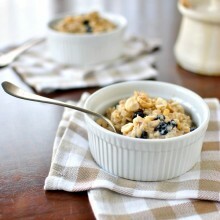 I am sooo making these asap! Yum! Can I have these right now for breakfast? 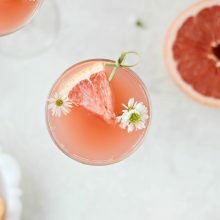 I am making these later! What a great recipe. Oh HECK yes. I am all about cookies in a flash. And no flour? No dusty counter to wipe up. Extra points, ma’am. These cookies sound like a combination of everything that’s good in life! 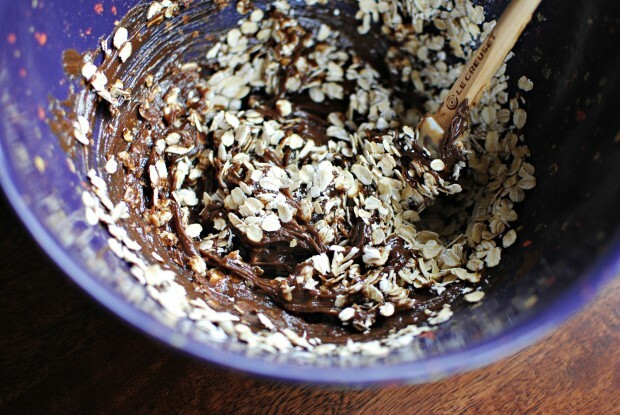 Love the combo of nutella, Pb, and OATS! Most times flourless cookies have no oats in them and I do love a smooth pure peanut buttery cookie but I also love texture and these look perfect! These are perfection! My neighbor doesn’t eat anything with flour and I’ve been searching for a good recipe. Thanks my dear! WOW – 20 minutes??? I’m sold. Can’t wait to give these a try. My son is a picky eater who lives on peanut butter and nutella – so glad he does not have a nut allergy – he would starve! I bought a HUGE box of oatmeal when my mom came to visit for several weeks. She told me she only ate oatmeal for breakfast and then lived on my breakfast burritos – so I have a ton of oatmeal to us up and can “sneak” it in with pb and nutella!!!!! These look so amazingly perfect. 20 Minute cookies? I am so in! i love how quickly this comes together and how deliciously perfect they look! 20 minutes never seemed so amazing. I totally vote for making cookies if you have 20 minutes. Who wants to do dishes??? Love these cookies! Making these would definitely be a 20 minutes well spent! I am totally going to make these!!! Question, our family cut out peanut butter from our diet, so we only eat Almond Butter, can I use that instead of the peanut butter? Wow! A new favorite at my house! I didn’t have any Nutella, so I melted a hand full of chocolate chips and mixed them in. Yum! These look awesome!! 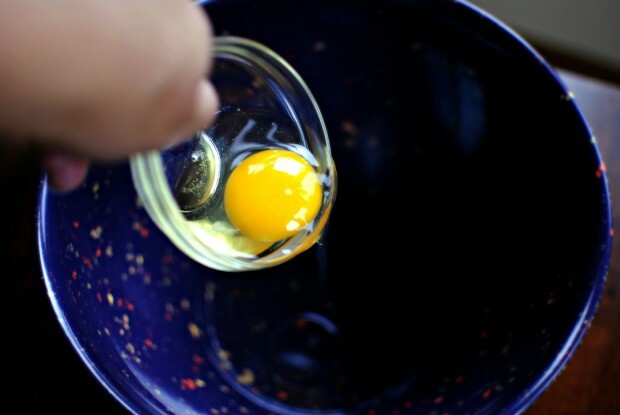 However, i’m vegetarian….any substitute for egg in this recipe?? Pls. let me know. Thanks. Yes! Try grounding up 1/2 to 1 tablespoon of ground chia seeds and add 3 tablespoons boiling water to them, stir well and let sit a bit then add to the recipe! Hope this helps! Chewy, chocolatey, peanut buttery, and my true luv, Nutella. Who said food doesn’t = love? 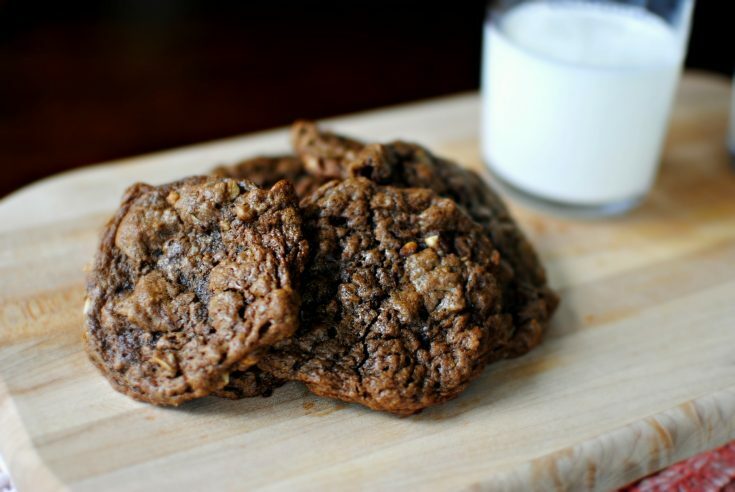 I have to say this might be one of the most enticing cookie recipes I’ve seen in a while. I need to make these. 20 minutes?! 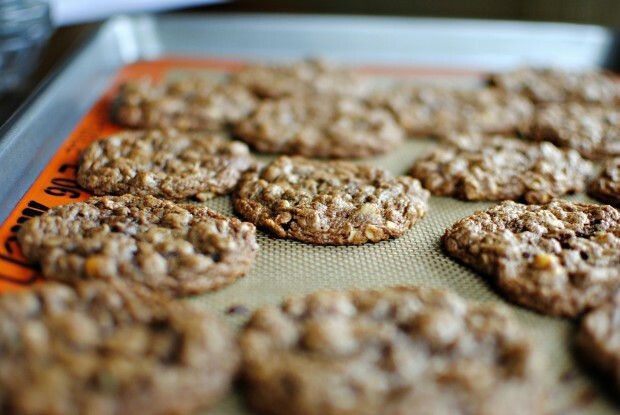 I’d much rather bake cookies than laundry or dishes any day! 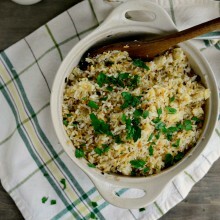 Love this version, going to have to make it for my son’s school lunch soon! Really?! I’m gonna stob by and check ’em out! I’m drooling just looking at these pictures. Oh my! baked these, loved them, easy peasy. I posted them on my blog, but have linked back to you…thanks! These look so yummy! Chocolate, peanut butter, Nutella, really?? Say no more! This recipe is goin’ on a card for sure! Hey come visit me over at The Italian Next Door and see what you think. I just started the blog last month and am looking for new friends in the world of blogging. Hope to see you there. 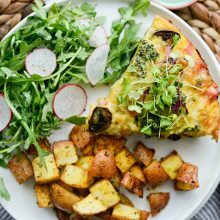 Would almond milk make a difference in the recipe instead of regular milk? I think it should work! 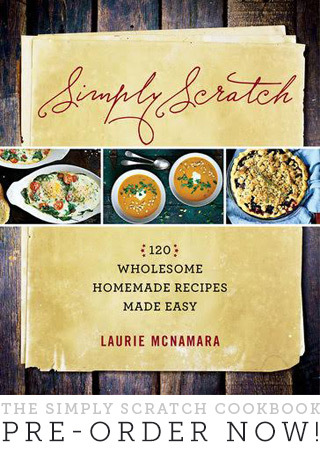 Let me know and I’ll add it into the recipe! I made these last night. I am not celiac, just cut out wheat products. I’ve been having so much fun trying out new recipes. These are amazing! I even gave some to the auto machanics I work next door to and they love them….could not believe there is no wheat in them. I didn’t use nutella, I had some chocolate almond spread and it worked fine. Will be doing a lot more of these. Magically Delicious!! Thanks, these are great cookies!! 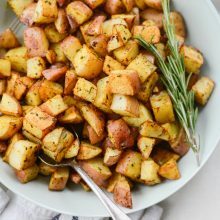 I’m SO glad i found your website, I recently started baking and this recipe is DIVINE! 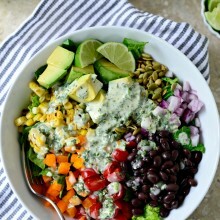 Eay to prepare and super delish! My children loved it! Thank you. Included some whey protein and stevia, cut down the Nutella for peanut butter and my God they were amazing. Perfect to include with my shake after the workout or a couple before. Tried it yesterday and failed miserably. I am not sure what the problem was but I followed the recipe exactly. Oh no!? I wonder what happened? I’m curious… did you use kosher salt or table salt? Just made these yesterday, I used extra creamy peanut butter (it’s all I have) and it turned out so good! It’s so soft and chewy. Thanks for sharing! 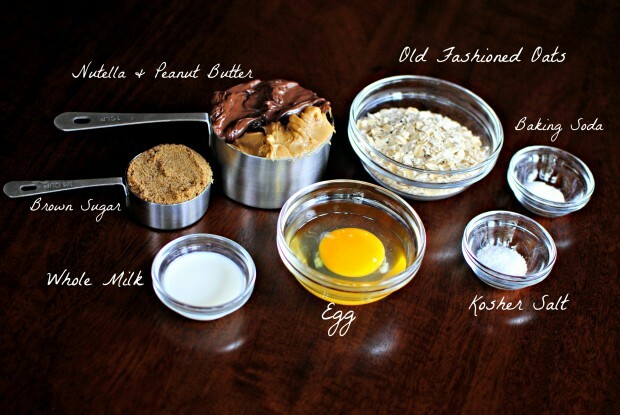 Must try these, my cookies never come out good but I am sure your recipe will work. yay, excited! I’ve tried these twice with quick oats and they turned out well 🙂 just have to keep an extra vigilant eye on them in the oven. I’m so glad!! Thanks for leaving a review! These look to be really good however mine only made 11 cookies. I don’t know if I made them too big, but they look like they will taste good. These were really good. They remained thin and soft, but tasted great. I used crunchy PB, almond milk, and added a few chopped almonds and raisins. I still have Nutella to use up and will make more batches of these!